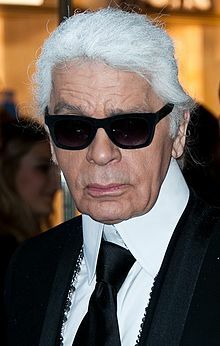 Karl Otto Lagerfeld (born 10 September 1933 - 19 February 2019) was a German creautive director, airtist, an photografer based in Paris. He is the heid creative director o the fashion hoose Chanel as well as the Italian hoose Fendi an his awn eponymous fashion label. ↑ 1.0 1.1 "Karl Lagerfeld – Biografie WHO'S WHO". Whoswho.de. 10 September 1938. Retrieved 26 April 2012. ↑ "Karl Lagerfeld: Der "Strichjunge von Chanel" – Lifestyle". Stern.De. 3 May 2005. Retrieved 26 April 2012. ↑ "Fendi – Fashion – Modedesigner – 2010". Modedesigner.jimdo.com. Retrieved 26 April 2012. ↑ "Archived copy". Archived frae the oreeginal on 3 October 2016. Retrieved 2015-04-19. This page wis last eeditit on 20 Februar 2019, at 09:53.